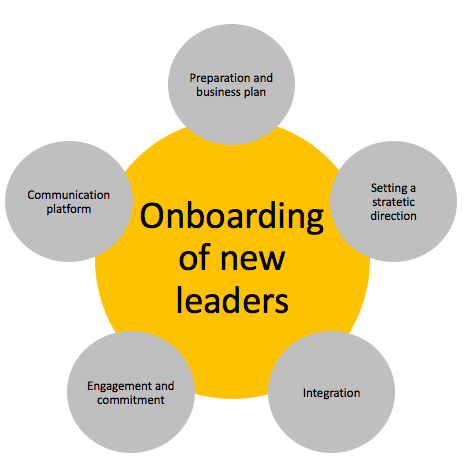 B+P Insights: Why spend time and effort on “on-boarding” your new key managers and leaders? According to Harvard Professor Michael Watkins it takes a new manager and leader 6-12 months to reach the break-even point of an employment – even in an organization where the fit is good and the likelihood for success is high. Professor Michael Watkins, who is also author of the book “The First 90 Days” has had extensive experience assisting organizations help executives integrate, reports that it takes at least 6 months before there is a real sense that the individual is contributing net value to the organization, and the “sink-or-swim” approach can often be a disaster. Watkins says that when leaders derail, the problems can be traced to vicious cycles in the first few months. And for every leader that fails outright, there are many others who survive but never realize their potential. So what is the solution? This is where the concept of “on-boarding” comes in. Most companies view on-boarding and introduction as one; they are not. Introduction programs focus on providing basic information to a newly hired or promoted leader to introduce the person to the business, its history, structure and who’s who. These are short-term programs for every level. On-boarding is a process meant to ensure leaders adapt and become full contributors in the organization; faster, better and with fewer problems. A good on-boarding plan should run at least 3 months. Reluctance and often failure by organizations comes from the flawed assumption that they have hired a senior and experienced person who should be able to figure it out on their own, believing the process ends with the hiring. The new managers’ prime responsibility is to become a student of the organization, and understand its history, values, vision mission, strategic plans, leadership style, and culture. Secondary the responsibility is to build relationships and networks, including identifying influential stakeholders and decision-makers, the informal power structure and developing trust. These responsibilities can be difficult to meet when placed behind a full desk and plenty of hidden issues left by the former manager. Given today’s hiring climate, the most successful organizations are those that use on-boarding strategies to build a competitive advantage by increasing leadership retention. They do not approach the entry of a new leader with a “sink or swim” mentality, but with an understanding that champion swimmers need supportive coaches and team members. Facilitates the new employee’s ability to contribute in the new role. Accelerate the ability to execute. Optimize the understanding of role and responsibility. Focus on short and long term KPI’s. Guidea a process with focus on the individual. Increases the new employee’s comfort level in the new role. Reinforces his/her decision to join the company. Encourages commitment and employee engagement. Facilitates feedback from all stakeholders to the new manager. Provides thorough insight in team members, own manager, colleagues and stakeholders personal profiles.